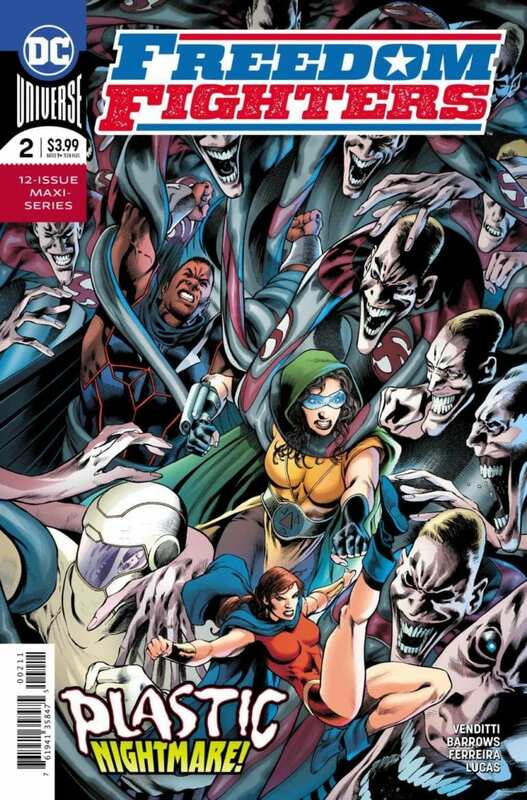 Review: FREEDOM FIGHTERS #2 is an Action-Packed Thrill! The Freedom Fighters Take On The Nazis in an Explosive Way! Earth X. A world where the Nazis won World War II. Where Adolf Hitler took America and killed its heroes, the Freedom Fighters, with them dead and their leader Uncle Sam vanishing, no one can stop the Nazi war machine. Decades pass and all hope for a free America appears to be gone. On the day of the Freedom Fighters’ deaths, a Nazi museum is destroyed. The culprits of this bombing reveal themselves to be a new version of the Freedom Fighters! To combat the reborn team, the Nazis send a giant robot to face them. Will the Freedom Fighters fall before they get a comeback? 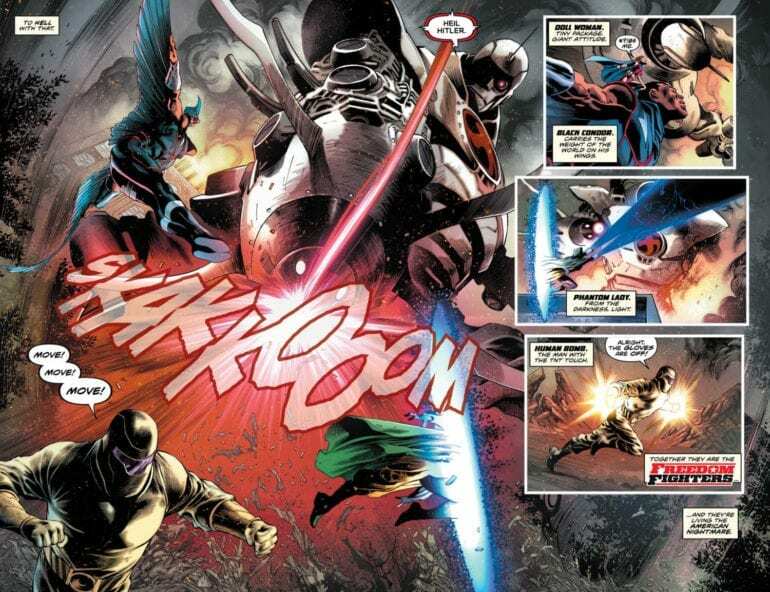 Picking up from right where we left off, the Freedom Fighters face off against a giant robot. We watch as each member of the team contributes to the fight. From Human Bombs explosive attacks to Doll Woman’s infiltration of the machine, no member is left out. The Fighters seek to gather information out of the machine to help their fight against the Nazis. After they clear the machine, they begin to fall back in their wicked escape ship. All the while, they’re scattering pamphlets of Uncle Sam everywhere. This begins to bring the long lost leader of the Freedom Fighters back from the dead. The biggest problem with this issue is also its greatest strength. This issue doesn’t give us character development in any sense. We don’t know the origin or personality of any of these characters. One could be disinterested because of this, but that’s where the positive comes in. Not many readers know of the Freedom Fighters. 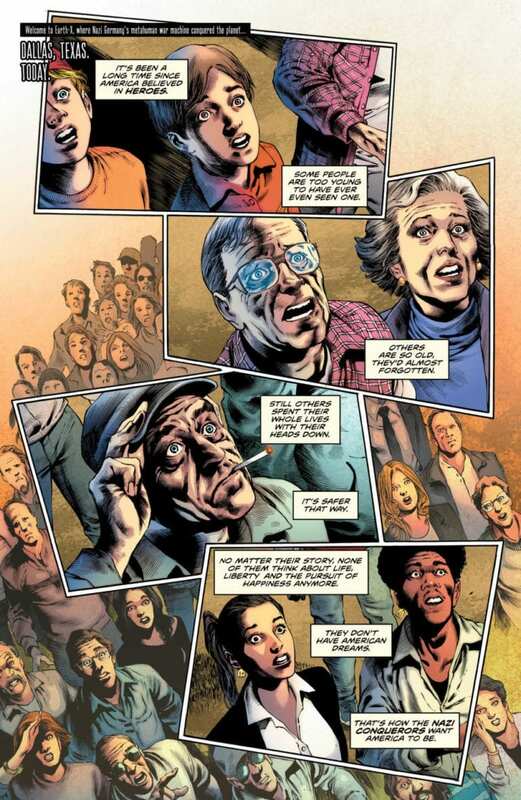 Their most popular appearance came in the Crisis on Earth X TV crossover, and it was just a single member. We need to know what these characters can do. How? With one big, badass fight scene. Each of the Fighters played their parts, showing off their strengths and powers. It was just a ton of fun to behold. The art for this issue was extremely well done. The battle almost cinematic levels of detail. Everything feels big because of the amount of effort put in. The page of the Human Bomb destroying the giant robot is still etched into my mind as I type this. There are so many panels similar that are just a wonder to behold. Whether it be the grandiose details of the battle or the expert colorwork, this was a great looking comic for the Freedom Fighters. While it’s not the issue I was hoping for, I did have fun with the Freedom Fighters. The battle against the regime is an excellent showcase of the heroes on Earth X. It gets even better when the art matches the action of the story. While it is fun, the story does need to move on from this. We need to connect with our heroes or else this is just going to be a hollow action romp. As it stands, however, if you love action filled comics, this is the one for you.